Now in its sixth year, International Book Giving Day continues to grow from strength to strength, reaching places such as Nepal, India, Canada, South Africa, UK, France, Germany, Australia, New Zealand, Italy, Nigeria, Fiji, Czech Republic, USA, Cambodia, Hungary, Philippines, and Romania. On February 14, participants are encouraged to give books to children. This can take many forms, the only limit is the imagination. Books have been sent to child refugees in Calais, France; a new library was created in Cape Town, South Africa; in Uganda the Mpambara-Cox Foundation gifted books to children, for many it was the first time they had been given a book of their own. In 2014, Scholastic Australia went to the Melbourne Children’s Hospital and gifted a book to every child. People continue to be creative in so many different ways, all keen to share the love of books. 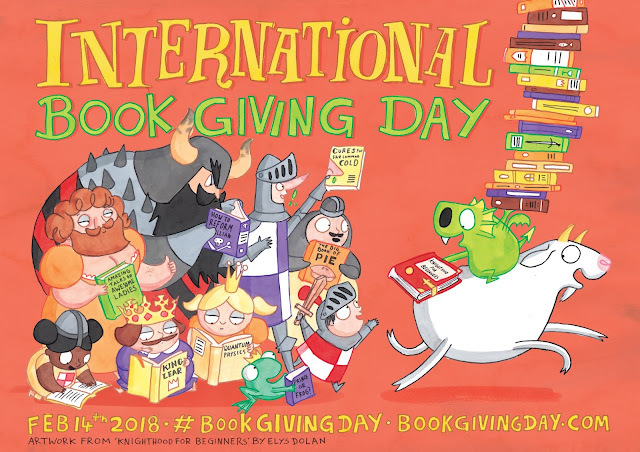 International Book Giving Day’s focus is on encouraging people worldwide to give a book to a child on February 14. We invite individuals to . . .
3) or donate a gently used book to a local library, hospital, shelter, or organization that distributes used books to children in need.